Toshiba, one of the pioneers on the combo drive market launches new solutions quite rarely, though its products are very reliable and have a lot of admirers in spite of some disadvantages. New solutions from Toshiba do not make their arrival triumphant, but it doesn't make them less interesting. Today we are going to test a new combo drive named Toshiba SDR1412T. CD+(E)G, CD-DA, CD-I, CD-I Bridge (Photo-CD), CD-I Bridge (Video-CD), CD-MIDI, CD-R, CD-ROM, CD-ROM XA, CD-RW, CD-Extra, CD-RW. 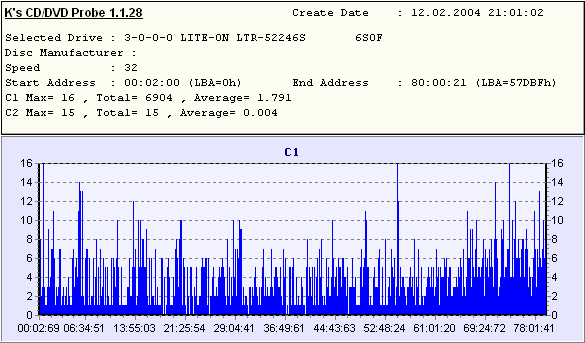 Write methods: Disc at once, Track at once, Session at once, Packet write. The drive came in the OEM package, i.e. without any accessories. The new model from Toshiba doesn't differ in appearance and design from the other models in the line of optical drives. 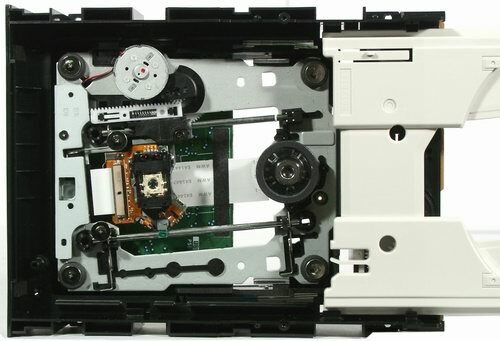 Toshiba's optical drives are a classic example of an ascetic device without any controls on the front panel. There's only an Open/Eject button and an emergency eject hole and a two-color LED. Look at the drive's base. 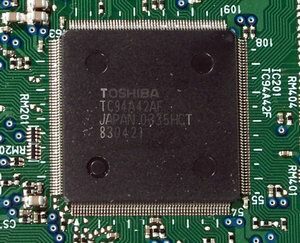 The chipset is Toshiba's proprietary solution. The photo above shows the contents of the drive case. 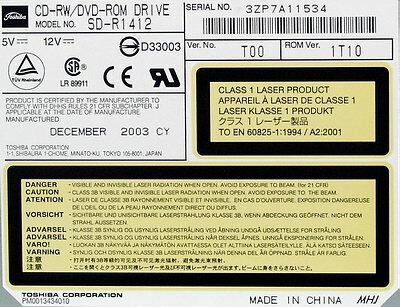 The label on top provides information on all drive's features. The installation caused no problems. 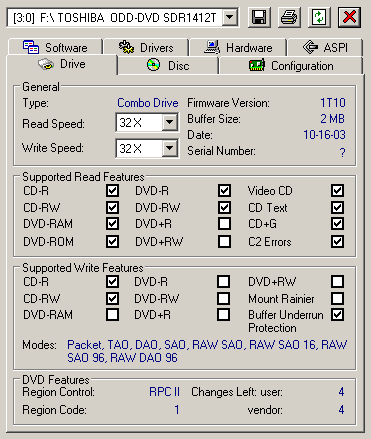 A user is offered a standard procedure, like that for an ordinary CD-ROM drive. The drive needs no special drivers. You can do just with the NeroBurning Rom; as for me, I used the latest version - 6.3.0.2. 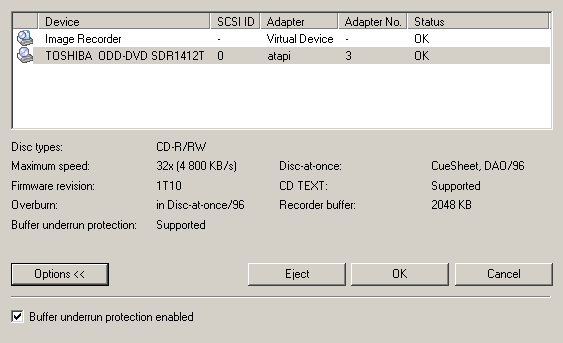 According to www.firmware-flash.com it's still impossible to turn the drive into RPC-1. However, you can use the DVD Region free program which provides the regional protection. Traditionally, we used two types of media, with cyanine and phthalocyanine coating. The number of the trade marks were lifted up to 4, 2 of each type, to get more information of how the drive treats discs of different trade marks. Below is the ATIP for the discs tested. The drive selects different write speeds for different media types. We also tested ability of the drive to record cyanine discs at the minimal speed, - the mode usually used by audiophiles to get the highest quality sound. The choice of burn speeds is not that rich. Drive Philips 52x. Mirex 48x. Verbatim 48x. Verbatim Pastel. To extend the picture, I added the results of burning of CD-RW discs. Drive TDK 12x. Verbatim 24x. Formatting and recording of the 80mm CD-RW disc in UDF, 4x burn speed. 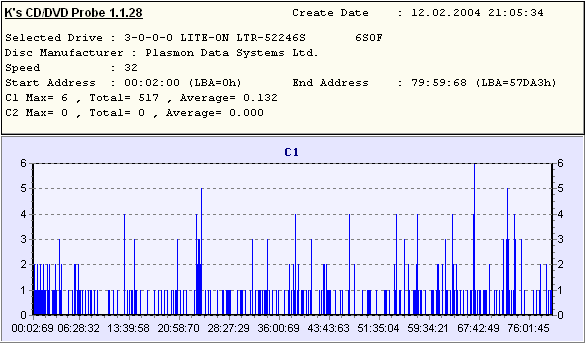 New Mirex discs with ATIP Plasmon are incorrectly identified by some programs, like it takes place in this case. The drive was also tested for ability to read a file that contains a signature that turns into a sequence of data repeating Sync Header. This problem was closely studied in this article. The drive has successfully read the test files. 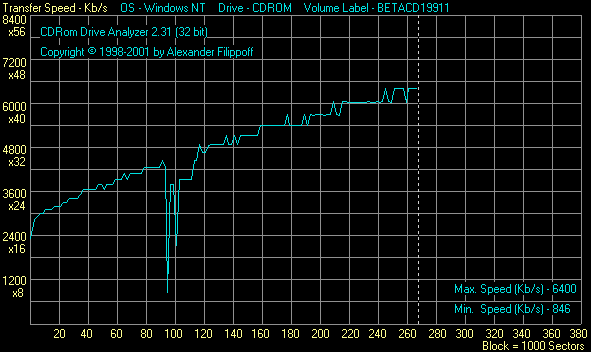 The detailed information on the tested parameters is given in the help file to the Nero CD Speed test program. If you don't want to download the utility, here you can find the HTMl help file. 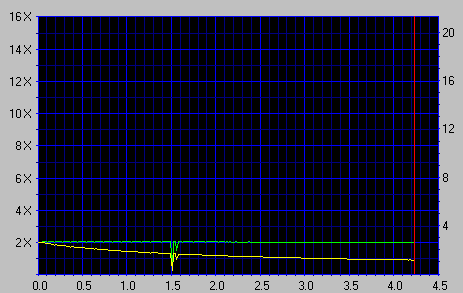 This test was made by the developer of EAC, and it's called DAE Quality (see its description here). 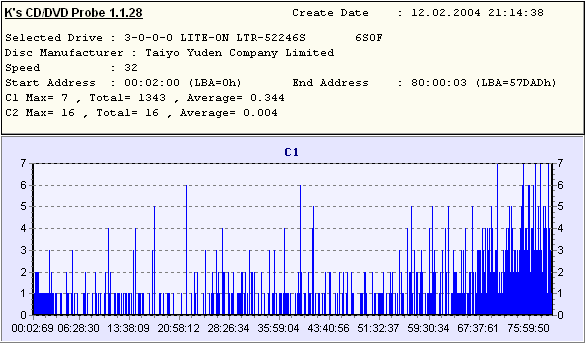 In short, it measures quality of audio data extraction and quality of C2 error processing with a special test disc. In this case it's impossible to measure C2 processing quality, you just look at the general data on quality of audiotrack extraction. The drive successfully copied the contents of the 832MB drive without any errors. 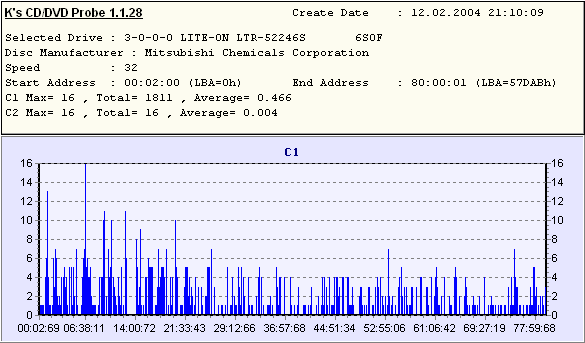 MITSUMI DR-6800TE - 5 min. 36 sec. 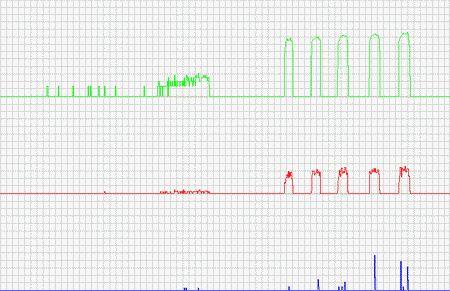 TOSHIBA SDR1412T- 8 min. 46 sec. 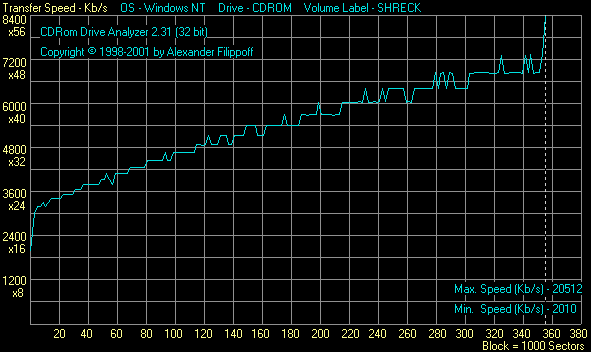 The drive is not that noisy; but you may feel discomfortable when working with CDs at high speeds. 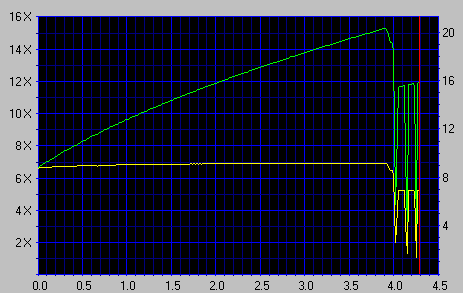 Besides, the drive is very sensible to the disc balance quality, and it might vibrate if they are poorly balanced. 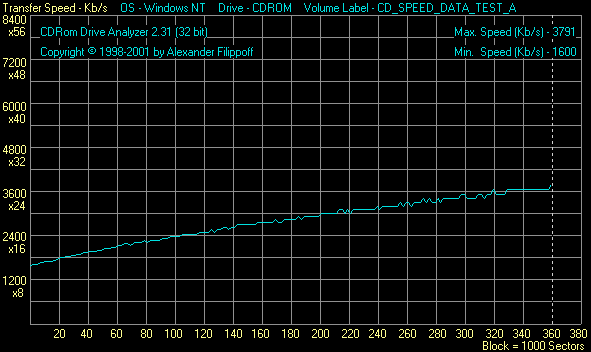 The speeds can be reduced with external programs (CDBremse, Nero DriveSpeed). 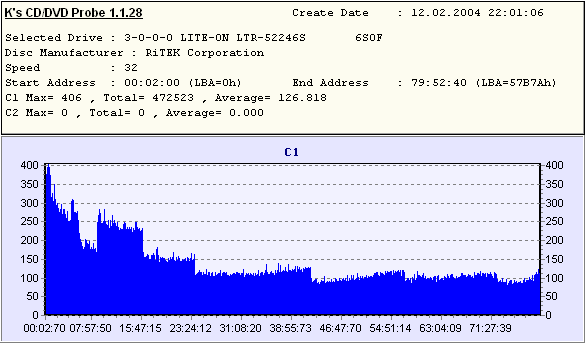 The programs allow setting the following read speeds: 48x-40x-32x-24x-16x-12x-8x-4x. 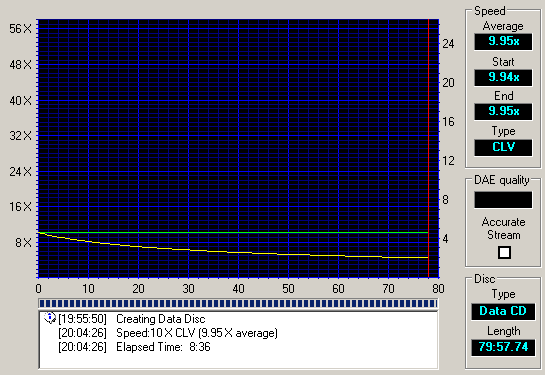 The drive is very sensible to the disc balance quality. It vibrates and makes a lot of noise when reading poorly balanced discs at high speeds but it managed to finish reading the test CD. I thought the disc could get damaged but it didn't. The new combo drive from Toshiba doesn't possess any outstanding features, it keeps in the middle. The new model is faster at writing and reading CDs. The burn and read quality is very good for all media types. 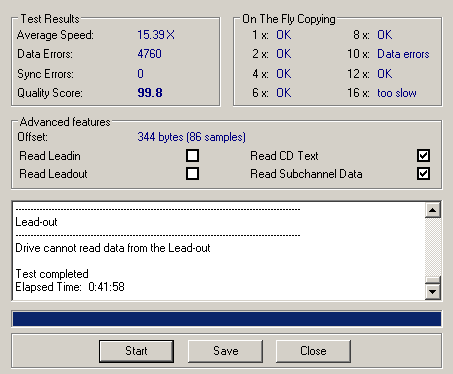 Unfortunately, the read speed of recordable DVDs is still low but I hope that it will be solved when the cracked firmware becomes available, like it happened to Toshiba 1802 DVD-ROM. The new-comer is very critical to the disc balance quality, and such discs usually make the drive vibrate and produce a lot of noise. 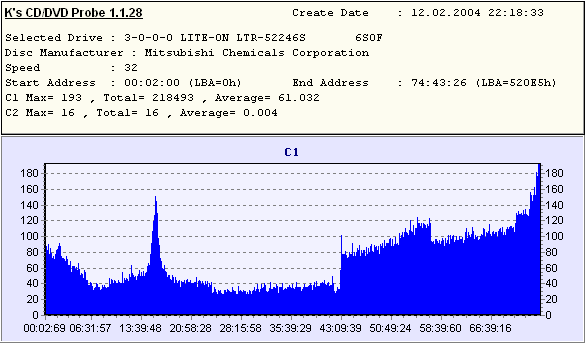 On the whole, Toshiba maintains its high-level authority, and this drive can be recommended for any user.